What’s Going On With Pokemon Go In Muncie? Pokemon Go in Muncie is alive and thriving. Pet adoptions are still being promoted and given awesome media attention. Gamers looking for catches, lures and rares will be in luck in our city. There’s key hot spots near Minnetrista, Ball State and this Pokemon GO map is a cool resource if you want to build your team and see what’s going on around the world. So what’s going on with Pokemon Go in Muncie? Our local Facebook group has hundreds of players that routinely post tips and good spots to visit. Campus is a prime location for families, as is downtown Muncie. If you’re new to the game or just curious as to what it is, here’s a good article to check out. The Muncie Animal Shelter is still feeling the effects of the Pokemon Go in Muncie thing. At last count, 2 of the dogs that are featured in the video below have been adopted. I’ll continue to post updates so stay tuned for more on this! For more information, updates and tips on how to play it safely while you’re walking a dog, visit Tips For Pokemon Go Players Who Walk Muncie Animal Shelter Dogs. If you watched the video above, you noticed that Facebook came to Muncie and made a video, well that video goes live on Friday, July 22 and we can’t wait. 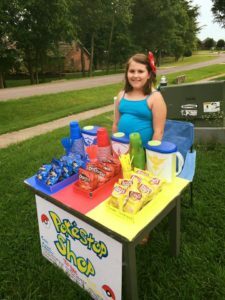 I’ll leave you with this: This young lady is an entrepreneur in the making! This picture is from the Pokemon Go: Lugia Alliance Facebook page. What a fun idea and a way to earn a little extra cash…rock on girlfriend. P.S. Want to take a weekend trip out of town and need someone to watch your pets? We’d love to talk to you and see if we can help. Browse our site, check out our prices and then complete your pet care forms online. We’ll set up your free consultation after.